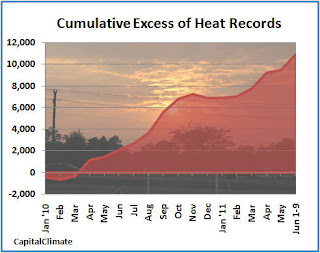 After narrowly exceeding cold records in May, U.S. heat records in the first 9 days of June have outnumbered cold records by an eye-popping ratio of 13 to 1. For the year 2011 to date, the ratio is a more modest, but still impressive, 2.2 to 1. The cumulative excess of heat records over cold records since January 2010 is over 10,000. 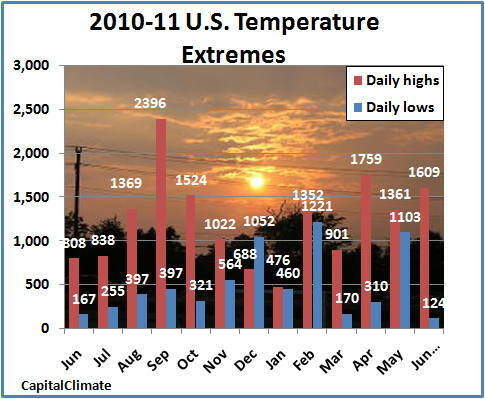 Since March 2010 there has been only 1 month (December) with more low temperature records than high temperature records. Although June temperatures to date have been particularly cold in California, they have been warmer than average nearly everywhere east of the Rockies. 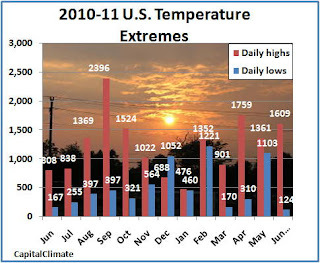 Monthly total number of daily high temperature and low temperature records set in the U.S. for June 2010 through June 9, 2011, data from NOAA National Climatic Data Center, background image © Kevin Ambrose (www.weatherbook.com). Includes historical daily observations archived in NCDC's Cooperative Summary of the Day data set and preliminary reports from Cooperative Observers and First Order National Weather Service stations. All stations have a Period of Record of at least 30 years. May I have some more CO2, please? 5 PM Update: Newark raised its record temperature to 102°, beating the old record by 3°. 4:10 PM Update: The National Weather Service reports that Washington hit 102° between hours, tying the all-time June record set in 1874. Washington Dulles has also broken its record with 97°, exceeding the 96° in 1999. 4 PM Update: Washington's temperature is 101° at 4 pm, 1° below the record for the date and the all-time June record. This is also tied for the second earliest 100° or higher. The earliest was on June 5, 1925. 2:30 PM Update: The heat is particularly intense in New Jersey. The National Weather Service reports that Atlantic City NJ has already blasted away its old record of 98° from 2008 with a reading of 101°. 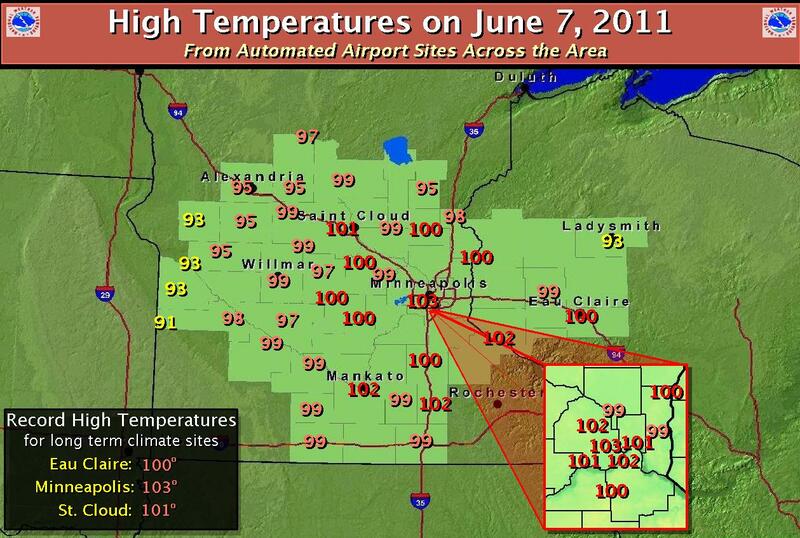 This is also the earliest 100° temperature by almost 2 weeks, surpassing the old record on June 22, 1988. The 101° at Newark NJ breaks the old record of 99° in 2008. Toms River NJ is also at 100°. 2 PM Update: Baltimore has hit 100° between hours to break the record. This is the second earliest 100° temperature at Baltimore. The earliest was 101° on June 5, 1925. Downtown Baltimore is 102°. Washington has reached 99°. Frederick MD is still at 100°. Salisbury MD, Culpeper VA, and College Park MD are all 99°. The record Mid Atlantic early summer heat wave continues today. As of 1 pm, Baltimore has already tied its June 9 record high temperature of 98°, last reported in 1933. The 98° at Washington National is still short of the record of 102°, which is also the all-time June record high. Washington Dulles is at 95°, just below the record 96° in 1999. Frederick MD and downtown Baltimore are both at 100°. 5:30 PM Update: The high temperatures of 99° at both Washington National and Baltimore are new records. The high at Washington Dulles of 96° missed by 1 degree. The Central Park NY high of 94° missed the 1933 record by 1 degree. After crushing heat records in the Midwest yesterday, soaring temperatures have now moved eastward. The 98° at both 3 pm and 4 pm EDT in Washington at least ties the record for June 8 set in 1999, and the 98° in Baltimore (BWI) breaks the record of 97°, also from 1999. For the first week of meteorological summer (June-August), new high temperature records (1,208) have outnumbered low temperature records (115) in the U.S. by over 10:1. Midnight CDT Update: With one hour left to go in June 7 (local standard time), the temperature is currently 86° at Minneapolis. The morning low of 78° beats the old warmest minimum for June 7, set in 1959, by 7°. Today's low temperature is equal to the average high temperature for June 7. 9 PM CDT Update: The hottest day in Minneapolis since 1988 snarled rush hour traffic as buckled pavement closed 3 lanes of Interstate 94. TODAY AT 456 PM CDT. THIS BREAKS THE OLD RECORD OF 95 SET IN 1987. TODAY. THIS BREAKS THE OLD RECORD OF 97 SET IN 1987. TODAY AT 233 PM CDT. THIS BREAKS THE OLD RECORD OF 96 SET IN 2004. TODAY. THIS BREAKS THE OLD RECORD OF 95 SET IN 1987. It's only the first week of meteorological summer (June-August), but high temperature records are falling by wide margins in Minnesota and southern Wisconsin. The first 100°+ reading since July 31, 2006. The first 103°+ reading in almost 23 years, since July 31, 1988. The second earliest on record that 103° had occurred, only behind May 31, 1934. 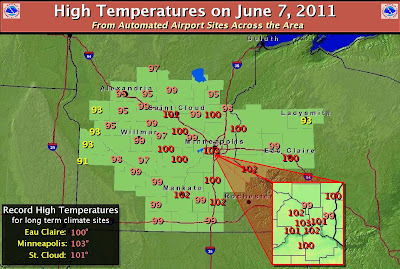 Today's record high follows a record high yesterday (June 6) of 97°, beating the old high of 95° in both 1987 and 1979. TODAY AT 254 PM CDT. THIS BREAKS THE OLD RECORD OF 95 SET IN 1987. THE HOTTEST IN 5 YEARS. THIS IS ALSO THE HOTTEST JUNE WEATHER IN 16-17 YEARS. A strong and persistent low pressure area off the Pacific Coast brought record rainfall to the San Francisco Bay area on Saturday, June 4. The 0.66" of precipitation at San Francisco Airport was over 4 times the old record for the date of 0.16" in 1947 and 6 times the long-term average for the entire month of June. Records began at the airport location in 1927. The 1.07" in downtown San Francisco through 6 pm was more than double the old record of 0.49" in 1939. Although Oakland Airport observations began only in 1948, the 0.88" there swamped the old June 4 record of 0.04" in 1984. At San Jose, where records date back over a century to 1893, the 0.88" blew away the old record of 0.18" in 1993. Because of the persistence of the pattern, much of central and northern California has had at least 600% of normal rainfall this month to date. On the other hand, there has been virtually no precipitation east of the Sierras.